Go through HAS to get to RII-North. See Extended Introduction for more on getting there. The “Temple of Ra” is filled with solar energy. It is the solar energy that burns away or breaks down karmic ties that binds you in your physical life. It is a transformation to a higher state of being and it is the fire energy that does that. Every action and thought carries with it repercussions. If some action or thought creates disharmony with others, or yourself, a karmic wave is generated that will exert a self correcting influence upon you. It is the universe’s way of letting you know that you are opposing the solar current. Creations that oppose solar current are degraded. Creations that go in the same direction as the solar current are enhanced. Most situation-karma will affect you negatively, by adding to your spiritual journey or making it harder. Unlike relationship karma (TEX-North, Karma Cube), which can have seemingly positive effects, situation karma really will be undesirable. In many ways this kind of karma is easier to spot and even work out. Inside the “Temple of Ra” you can find out what situation karma you possess and even be presented with ways to burn it off or shatter it. As such, the “Temple of Ra” can become a much needed and desired place to visit often. It is the hope that you do not take on any new karma, but it does happen from time to time. Physical reality is a training reality. So if you find you have taken on new karma, then revisit here to work this energy out, so that your spirit will remain balanced. The "Temple of Ra" is also a good place to visit anytime you want in infusion of the solar current to help move or transform a stuck reality to a higher level. It excels at neutralizing karmic energy, but its other benefits make this a place to stop by often. Reality Creating uses solar energy and you will not find a higher concentration of solar energy in any other place than here. Do not let the fiery environment put you off. This is a wonderful solar energy that warms and comforts. It gives hope to dire situations in your life and fills you with creativity and good mental clarity. There are a few outstanding nonphysical places to visit, I have to say this is one of them. 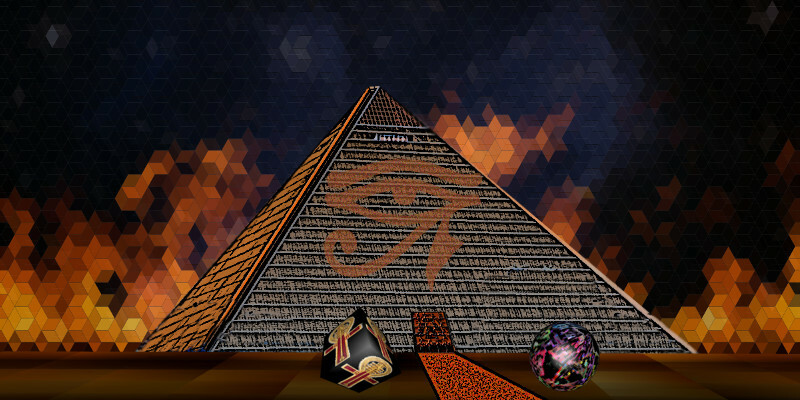 At the front of the “Temple of Ra” are two spirit guides, symbolized by the jewel sphere and the ankh cube. You can consult with them if you want. The jewel sphere guide can help you with the rewards of lifting your karmic burdens. The ankh cube guide can help you lessen the discomfort from your karmic load if it is heavy. Then walk into the “Temple of Ra” and be thrust into an adventure that will help you discover and offer a means to clear your situation-karma. TEX-North, Karma Cube can reveal karma that is related to relationships, like friends, family, coworkers, enemies. Situation-karma can take some time to work out if it is embedded deelpy. Be patient with it and yourself. Gift: Ankh necklace from ankh cube for strength to overcome karmic challenges. Gift: Halberd of Guan-Lu for slaying your karma. RII is broken up into four regions and we will cover each one in a separate article. Gift, Wings: Given to you if you have neutralized all your karma (relationships and situation). This gift is also avaiable in TEX-North. Hermes unofficial rock and roll song for this location: This is how we do., by Katy Perry.